Lord Dattatreya is the incarnation of the Holy Trinity consisting of Lord Brahma, Vishnu and Shiva. He thereby has the combined qualities of the Trinity. He is considered as the Guru of all Gurus. This incarnation of the Creator, the Protector and the Destroyer is said to be very kind to his worshipers and bless them with all they need. Lord Dattatraya is normally portrayed with a cow representing Bhoomi Devi (Mother Earth) and four dogs at his feet representing the four Vedas. 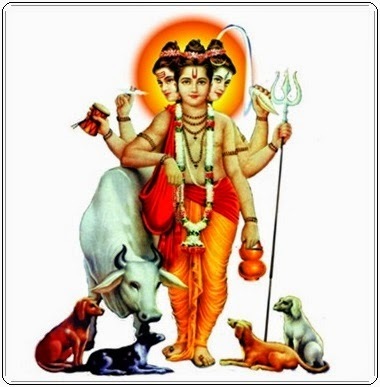 Dattatreya has three heads symbolizing the unity of Brahma, Vishnu and Shiva. He also represents the time (past, present and future) and the 3 main aspects of the Universe (creation, preservation and destruction). The taraka monosyllable mantra of Dattatreya is 'Daam' and the six syllable mantra is 'OM, ShriiM, HriiM, KliiM, GlauM, DraaM. Given below are some of the popular mantras of Lord Dattareya. It is said that chanting these mantras can help counteract the malignant influences of the planets (navagrahas), cure diseases and bring peace and joy.